This Cook’s Illustrated recipe inspired me to purchase my first “real” cookware: a beautiful cast iron enamel Dutch oven. After my dad asked me to print out this recipe for him, I looked it over and printed a copy for myself. Then he asked me to help him order a Dutch oven and pick it up for him. After doing so, I copied him again and ordered a Dutch oven for myself. With my shiny new pot in hand (well, in two hands — these things are heavy! 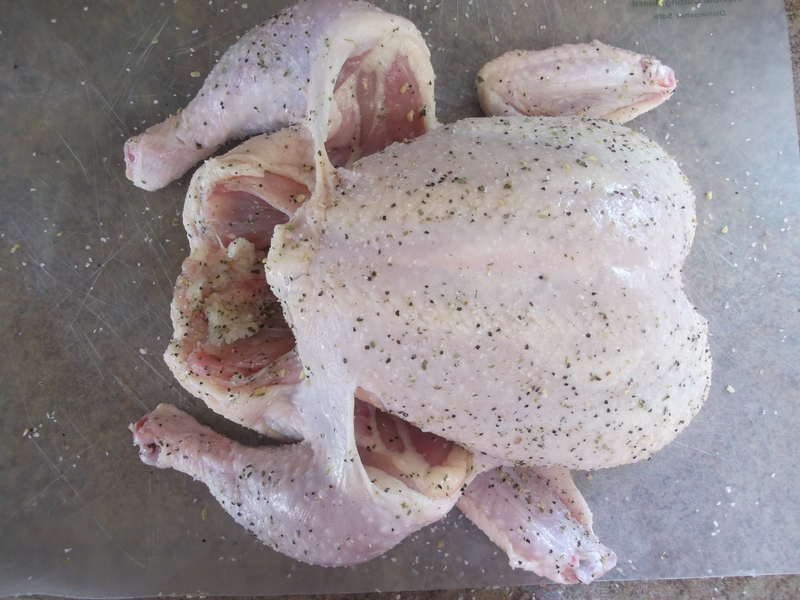 ), I set out to prepare this “French” chicken. The results were worth it: not only did I get a new Dutch oven that I love, but I got a new method for making a perfectly cooked, tender and flavorful chicken. Every single time! The only thing I changed from the original recipe is adding Sunny Paris seasoning to the salt and pepper rub. Sunny Paris is onne of my favorite spice blends from Penzey’s — it’s yummy blend of basil, bay leaf, chervil, chives, dill weed, peppercorns, shallots, and tarragon. Adjust oven rack to lowest position and heat oven to 250 degrees. Pat chicken dry with paper towels and season with salt, pepper and Sunny Paris seasoning, if using. Heat oil in large Dutch oven over medium heat until just smoking. Add chicken, breast‑side down; scatter onions, celery, garlic, bay leaf and rosemary around the chicken. Cook until breast is lightly browned, about 5 minutes. 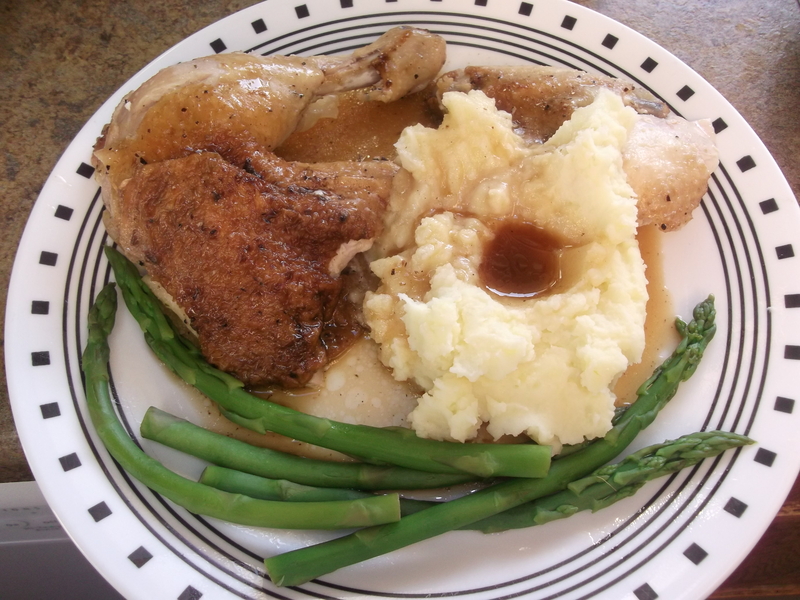 Using a wooden spoon (or tongs) inserted into cavity of bird, flip chicken breast-side up and cook until chicken and vegetables are well browned, 6 to 8 minutes. Remove Dutch oven from heat; place large sheet of foil over pot and cover tightly with lid. Transfer pot to oven and cook until an instant-read thermometer registers 160 degrees when inserted in the thickest part of the breast and 175 degrees in the thickest part of the thigh. 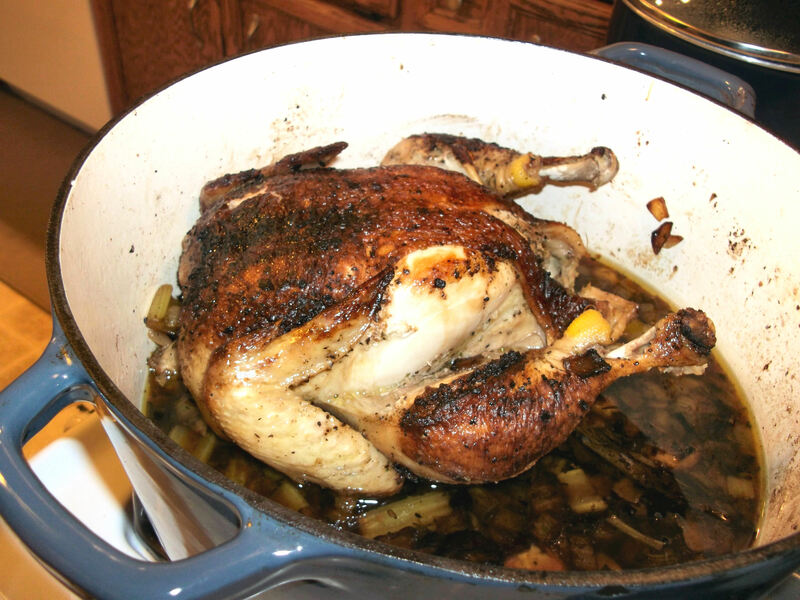 Approximate cooking times are about an hour for a smaller chicken, and close to 2 hours for a larger chicken. Transfer chicken to carving board, tent with foil, and rest 20 minutes. 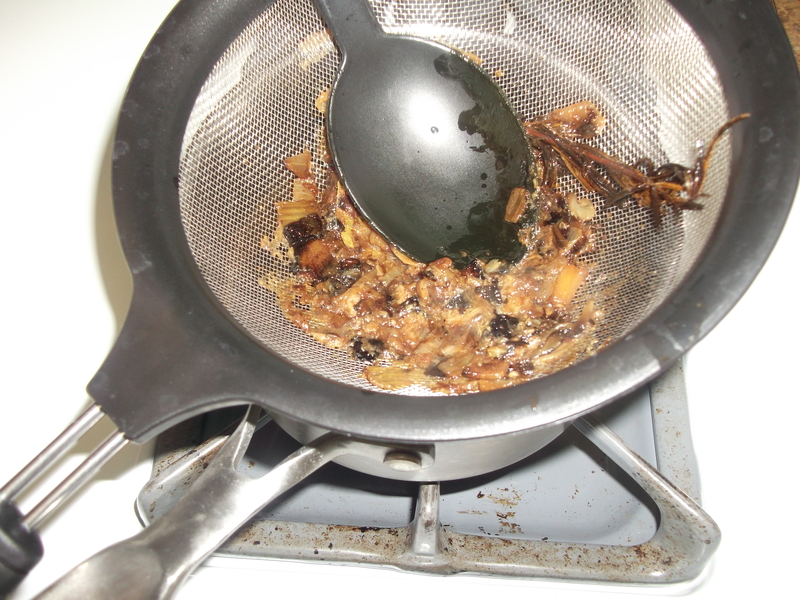 Meanwhile, strain chicken juices from pot through a fine-mesh strainer into fat separator, pressing on solids to extract liquid; discard solids (you should have about ¾ cup juices). Allow liquid to settle 5 minutes, skim off the fat, then pour liquid into a saucepan and set over low heat. The amount of jus will vary depending on the size of the chicken; season it with about ¼ teaspoon lemon juice for every ¼ cup. Carve the chicken, adding any accumulated juices to saucepan. Serve chicken, passing jus at table. Get your ingredients ready before you begin. They all get used right away, so prep them before you do anything else. Smash each garlic clove and peel it, but leave it whole. 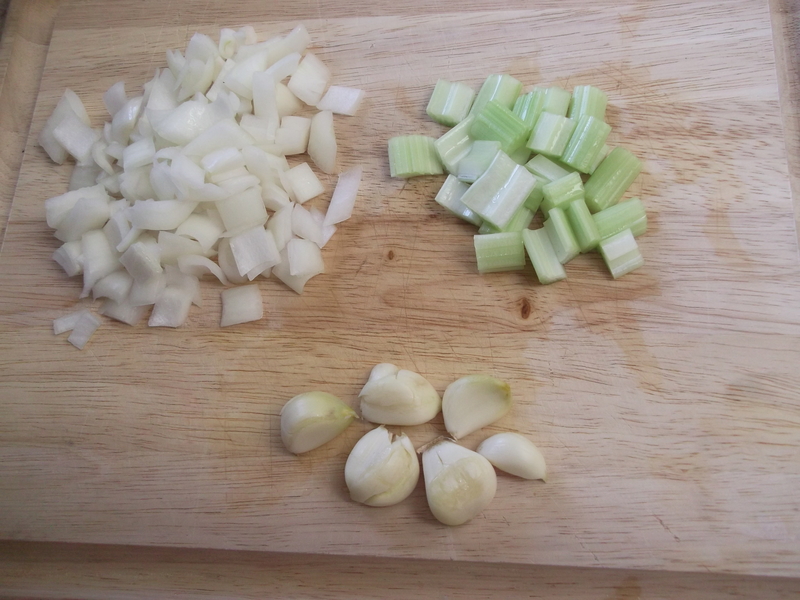 Cut the celery and onion fairly large: these are just for flavor and will be discarded at the end. 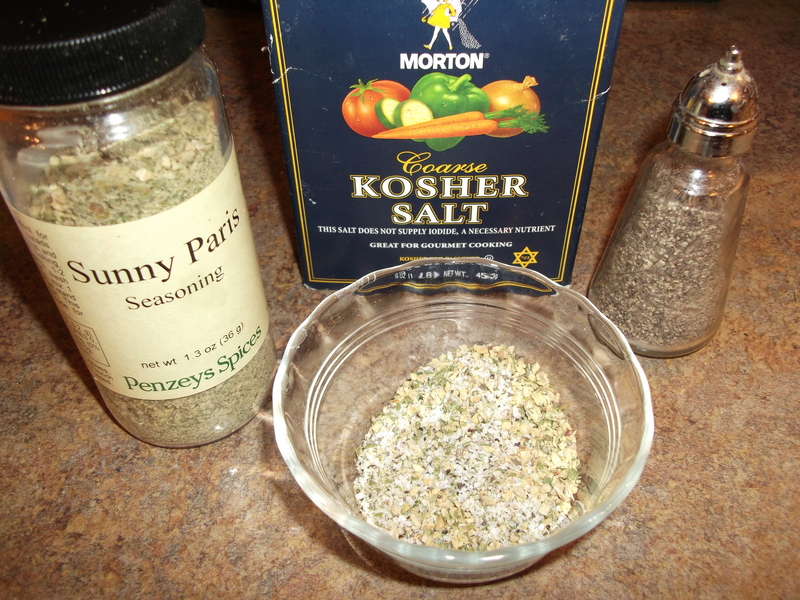 I like to mix the salt, pepper, and Sunny Paris seasoning together so it is easier to apply evenly on the chicken. Here’s a tip I learned to help chicken cook more evenly, so the breast meat won’t get overdone while waiting for the leg meat to finish cooking. 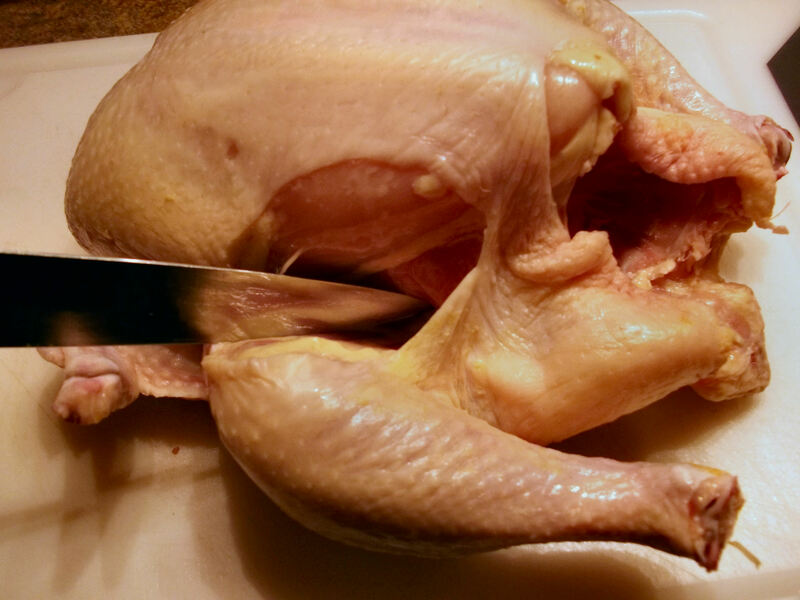 Make a small cut into the drumstick and thigh joint, at the end of the ‘meaty’ part of the drumstick, in the area that is held together by the skin that gets taut as you pull the drumstick away from the chicken. Do this on each side. Making this cut will help the leg part of the chicken cook faster, so it will be done a little more in time with the breast being done. Pat chicken dry with paper towels and season generously with the blend of seasonings. If you don’t have Sunny Paris, you can add whatever other herbs and spices you do have that you like, but I still think that Sunny Paris really makes this meal. You may not want to use the entire amount of the seasonings on a smaller chicken, as it might get a little salty. Heat oil in the pot over medium heat until just smoking. Use just enough to lightly coat the bottom of the pan. 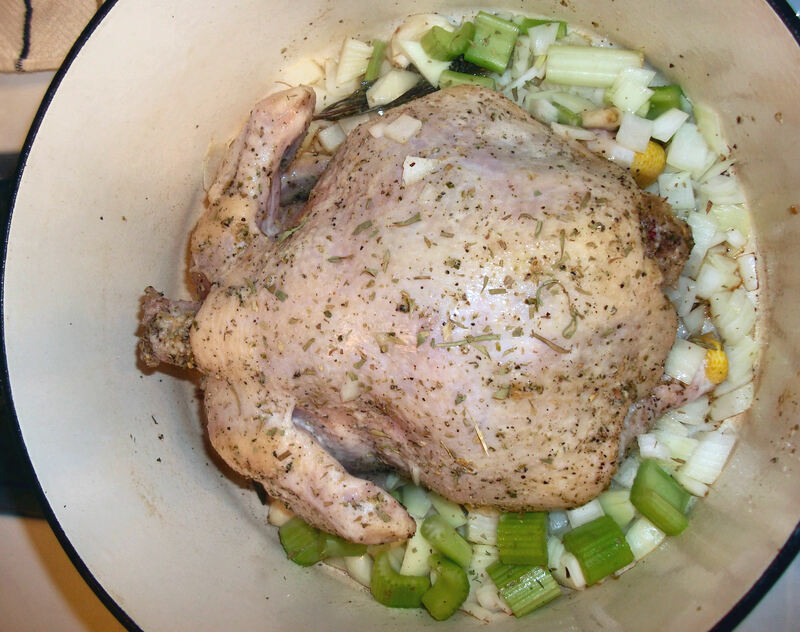 Add chicken, breast‑side down; scatter onions, celery, garlic, bay leaf and rosemary around the chicken. Cook until breast is lightly browned, about 5 minutes. Using a wooden spoon (or tongs) inserted into cavity of bird, flip chicken so it’s breast-side up and cook until chicken and vegetables are well browned, about 6 to 8 minutes more. Remove pot from heat; place large sheet of foil over pot and cover tightly with the lid. Transfer pot to oven. It may take even less time if you made the cut in the leg to speed up cooking time of the leg and thigh. The pot now contains a flavorful blend of juices from the chicken and vegetables. Strain these juices into a small saucepan through a strainer, and use the back of a spoon to press gently on the solids to extract more liquid. Discard the solids. You should have about ¾ cup of liquid (this amount will vary). 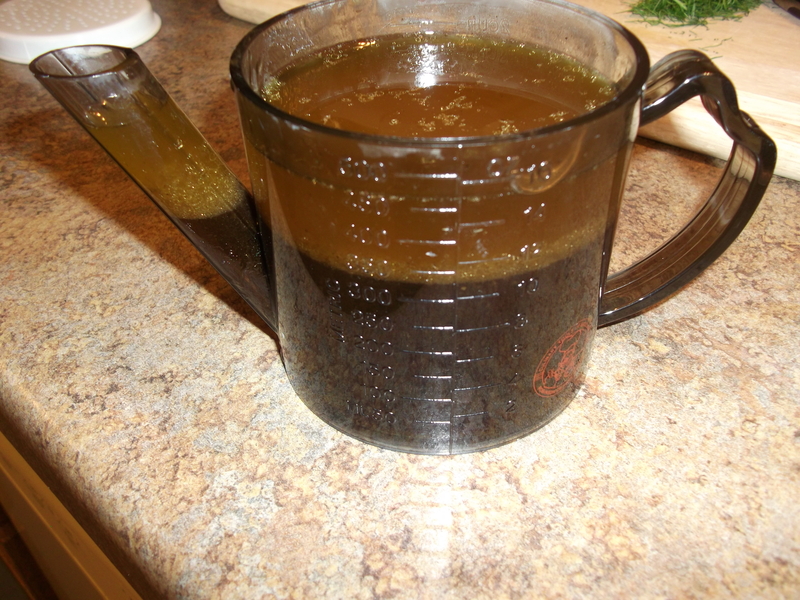 Pour this into a fat separator, if you have one, and allow liquid to settle 5 minutes. If you don’t have a fat separator, just let it sit. The fat will rise to the top and the juice will sink to the bottom, so you can just skim the fat off the top with a spoon or remove the liquid underneath with a baster. Don’t worry about getting every last bit of fat out: just aim for most of it. 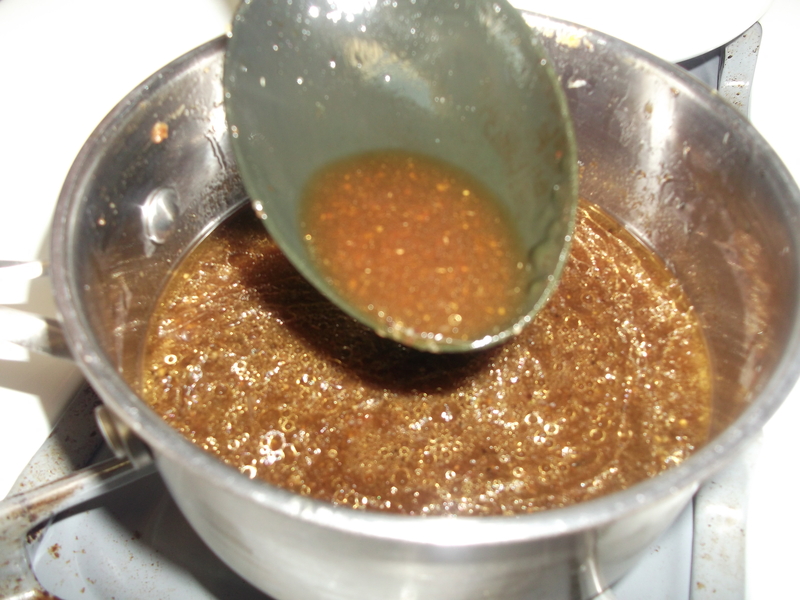 After the fat has separated, pour liquid into back into the saucepan and set over low heat. At this point, we’re going to start calling this liquid “jus” and we’re going to put it in italics. Say it with finesse: “zhooh!” Your guests will be impressed. The amount of jus will vary depending on the size of the chicken; season it with about ¼ teaspoon lemon juice for every ¼ cup of jus. Taste as you go: you don’t want it too tart. Carve the chicken, adding any accumulated juices to the jus. Serve chicken, passing jus at table. 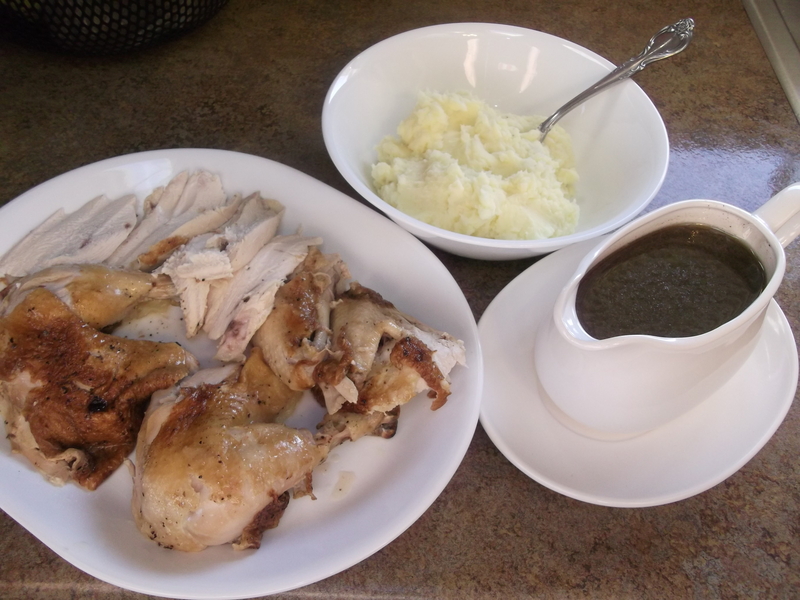 I love this meal with mashed potatoes! Enjoy! What an awesome way to cook chicken – I shall have to give it a pop. Like the mashed potato volcano with gravy in it!